You’ve heard it everywhere: Mobile is the next big thing. Or, it’s already the big thing. People are spending a lot of time time optimizing their web sites for mobile users, but have you thought about your e-newsletter? Email is one of the most used functions on smartphones. So if your e-newsletter is hard to read on a mobile device, you’re probably not connecting well with your audience. One of the great features of Mail on the Mark is that you can track the type email client in the data that reads all of your e-newsletters. Let’s take a look at some stats. 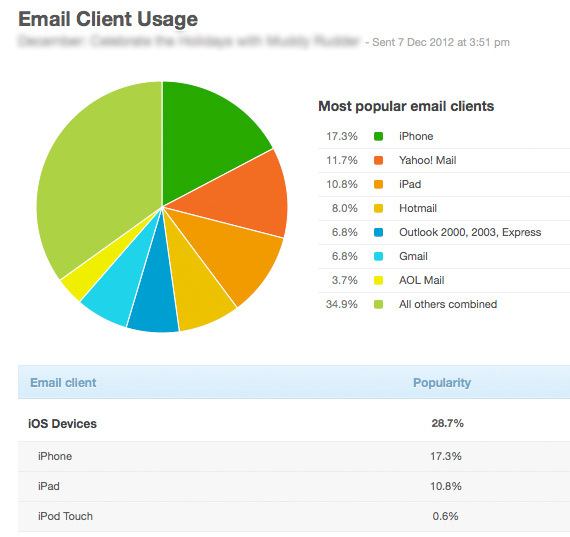 Email Client Usage for one a recent e-newsletter. Here is a partial review of the stats from a recent e-newsletter that a client sent. You can see that iOS devices accounted for more than 28% of their readers. Of note, Android users accounted for 2.8% It’s interesting to realize just how many devices see your e-newsletters. Also, because of Hotmail and Outlook’s mobile integration many of the 8% of the Hotmail users may be mobile viewers. With restaurants, many people provide a personal email address when they join an e-newsletter list. So they are more likely to be viewing the e-newsletter at home or on their personal smartphone. Email client usage for a corporate e-newsletter going to mostly work addresses. We have another client who sells mainly to a large companies. The email addresses on their list are mostly of work addresses. The news shared in the emails are specific to the industry. As you can see, the readership here is dominated by Outlook users. 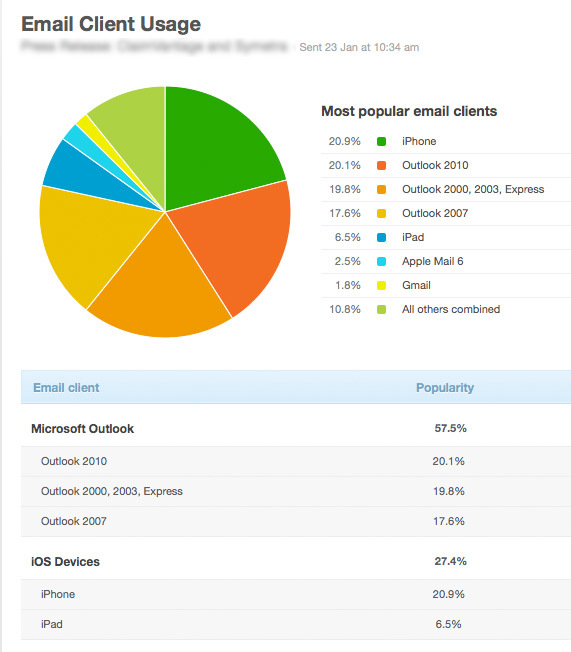 While iPhone users is nearly the same, Outlook users far outnumber the all of the iOS devices. There is also less deviation in all of the types of email clients used by the recipients. Our conclusion is that like with web design, e-newsletters that focus on the consumer market need to be mobile optimized. Ideally all e-newsletters are mobile optimized, but if your list is going primarily to work accounts where recipients sit at a desk to receive their email, it’s not nearly as pressing a problem. But if you are a restaurant, shop or other consumer-facing brand you need to get mobile-optimized on your e-newsletters asap. Do you need a mobile-optimized e-newsletter? Give us a call. We can set you up with a mobile-optimized e-newsletter. Just curious – if you open the same email message on an iPhone and in Outlook, does that double-count, or is it just the first platform that opens it? @Mike, Good question. With Mail on the Mark, if a subscriber opens the email in multiple clients it gets counted each time, and therefore shows up in different email client counts. Also, there are some email clients that don’t register at all. Some email programs just don’t identify themselves in any unique way. In our reports, they will be displayed as ‘undetectable’. I am going to recommend this wonderful post to my friend. this is absolutely illuminating post! With all the talk about the importance of mobile, I can see how creating e-newsletters specially optimized for these users would also be important. I read a lot of e-mails on my mobile device these days, and e-mails easy to read in this format get my attention first.